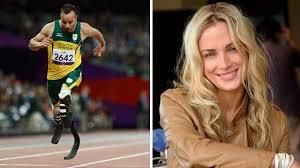 On day six of the trial Oscar Pistorius became ill as he listened to the pathologist, Gert Saayman, describe Reeva Steenkamps’ wounds. Pistorius also covered his ears and put his head in his hands throughout the testimony. The judge had to stop the trial at one point because of his retching. Saayman concluded that three of the four wounds could have been fatal and were immediately incapacitating. This entry was posted in Uncategorized and tagged Baba, defense, Gert Saayman., guard, murder., Oscar, Pistorius, Reeva Steenkamp, security, shots, sick, trial on March 10, 2014 by edimminger. 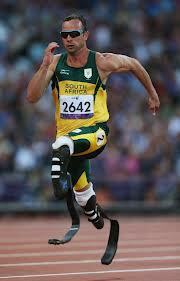 This entry was posted in Uncategorized and tagged blade, murder., Oscar, Pistorius, Reeva Steenkamp, runner., shots, testimony, trial on March 7, 2014 by edimminger.